"As important as his versatility, swing, and ability to interpret and interact, is the actual sound or timbre of his drums--Smitty has a true, resonant, musical quality that continues the lineage of Dodds, Catlett, Clarke, Roach and the Joneses (Elvin and Philly Joe)." Last year Roberta Swann and I presented five superb young jazz musicians in a series of concerts at the Great Hall of Cooper Union. The idea was to choose performers known almost exclusively as supporting players and have them organize their own bands. The results were, without exception, gratifying; yet Marvin "Smitty" Smith's band exceeded all expectations. The confidence and variety of his compositions, his playful approach to form, and his attention to detail placed him squarely in the tradition of jazz drummers who have a special penchant for delineating the nerve and heart of tightly coiled, intesely swinging jazz ensembles. He had, of course, already established himself as an instrumentalist of extraordinary range and virtuosity. 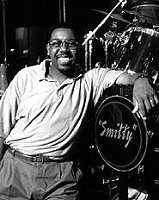 Smitty was born in Waukeegan, Illinois, in 1961, and began studying the drums "formally" at age three. After high school, he enrolled at the Berklee School of Music, and at 20 came to New York with the Jon Hendricks band. Good drummers are the life of every jazz scene; great ones are the hope and future. Having absorbed the work of a lineage of percussionists that stretches from Kenny Clarke to Jack De Johnette, not to mention the more general parameters of style begat by Charlie Parker, Miles Davis, and Sonny Rollins, Smitty found himself in great demand. He has appeared with the Frank Foster / Frank Wess band, Slide Hampton, Bobby Watson, Ron Carter, David Murray's Big Band, Dave Holland, Ray Brown, Hamiet Bluiett, Art Farmer and Benny Golson's Jazztet, Hank Jones, and Kevin Eubanks, among others. A selected discography of Marvin "Smitty" Smith albums. Keeper Of The Drums, 1987, Concord. Road Less Traveled, 1989, Concord.